I was sent a pre-release copy of Chris Lilly’s new book, “Fire and Smoke” and instantly realized I will be using this book often. Now you probably already know that Chris Lilly is a world Champion pitmaster and owner of Big Bob Gibson BBQ, so you know he is a man to listen to when it comes to BBQ. As I page through a cookbook for the first time I add little sticky notes to mark a page of a recipe I want to try first. After going through this book I realized I had 14 pages marked to try first. Yes, this book looks that good. While I am sure I will get around to trying each of those recipes, and more, I decided to start with this pork tenderloin dish. While we were eating it one of my sons said “this is the best pork tenderloin I have ever eaten.” Those are pretty big words because we eat pretty damn good around here so they are used to great meals. But he was right, this meal was very good. The recipe had a few different parts to it. There was a dry rub and liquid seasoning for the pork and then there was a dressing for the salad. I hit the pork with the dry rub before I started the grill, so it sat for about 35 minutes. This recipe called for some bacon to be fried, then some red onions, then the pork loin gets seared in the cast iron skillet on each side before going on the grill to smoke. I fried the red onions in some of the bacon fat. Pretty tasty in the salad. I then removed the onion and set it aside and proceeded to searing the pork tenderloin on each side for about 30 seconds. Once that was done it went into the Big Green Egg to smoke for a while. I added a remote thermometer and pulled it when the internal temp hit 145 degrees. While the meat was resting after being pulled from the smoker I prepared the salad. After the meat sat for about 20 minutes I sliced it up and served it. Set up your smoker or build a fire for indirect heat on your grill. preheat to 275 degrees. For the dressing, mix dressing ingredients together in a small bowl and set aside. For the liquid seasoning mix liquid seasoning ingredients together in small bowl and set aside. For the dry rub, mix dry rub ingredients together and then rub onto pork tenderloin. In a 10 inch cast iron skillet cook the bacon until until crisp. transfer the bacon to a paper towel lined plate. Add the pork tenderloin to the cast iron pan at medium high heat and sear on all sides for 30 seconds each. Remove the pan from heat and pour the liquid seasoning over the pork tenderloin in the skillet. Put the skillet on the smoker or grill on indirect heat until the internal temp of the meat reaches 145 degrees. Then remove the meat and cover in foil to let it rest for 15-20 minutes. Put the skillet back on the stovetop over medium heat and add the red onion and cook, stirring until the onion is softened but still crispy, then remove the onions. Transfer the onions, salad mixings, chopped up bacon, and mandarin oranges to a bowl and mix it up with the salad dressing. 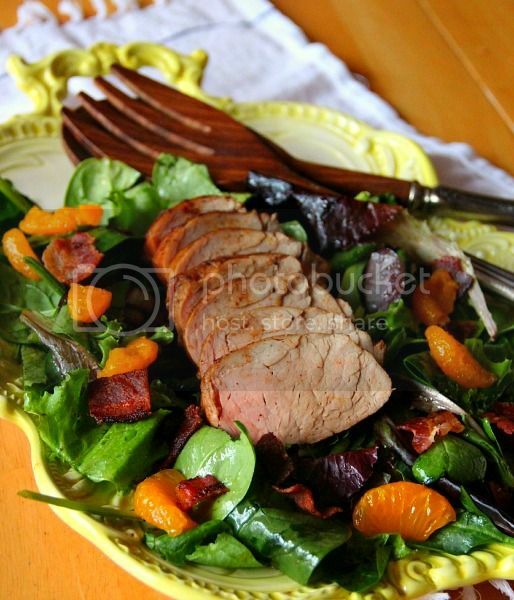 Slice the Pork tenderloin and serve over the salad. Recipe adapted from Chris Lilly's book "Fire and Smoke, A Pitmaster's Secrets"
You & Shelly Are A Match Made In Heaven. I Can’t Online Much Anymore But When I Do, I LOVE seeing Delicious Food & The Two Of You Have inspired me To Get Back Into the kitchen again.